Since testosterone is the primary male androgen, we should also expect to see pronounced androgenic side effects with this drug. Much intensity is related to the rate in which the body converts testosterone into dihydrotestosterone (DHT). This, as you know, is the devious metabolite responsible for the high prominence of androgenic side effects associated with testosterone use. This includes the development of oily skin, acne, body/facial hair growth and male pattern balding. Those worried that they may have a genetic predisposition toward male pattern baldness may wish to avoid testosterone altogether. Others opt to add the ancillary drug Proscar/Propecia, that prevents the conversion of testosterone to dihydrotestosterone. This can greatly reduce the chance for running into a hair loss problem, and will probably lower the intensity of other androgenic side effects. Although active in the body for much longer time, cypionate is injected on a weekly or bi-weekly basis in order to maintain stable blood levels. At a dosage of 250mg to 800mg per week we should certainly see dramatic results. 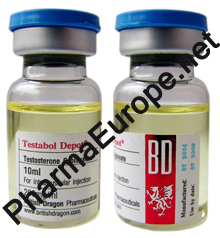 It is interesting to note that while a large number of other steroidal compounds have been made available since testosterone injectables, they are still considered to be the dominant bulking agents among bodybuilders. There is little argument that these are among the most powerful mass drugs. When taking dosages above 800-1000mg per week there is little doubt that water retention will come to be the primary gain, far outweighing the new mass accumulation. The practice of "megadosing" is therefore inefficient, especially when we take into account the typical high cost of steroids today.